The Lunge to Med Ball Diagonal Reach is a functional training exercise for beginners to improve synergy of the neuromuscular system, core stability, body control and coordination. 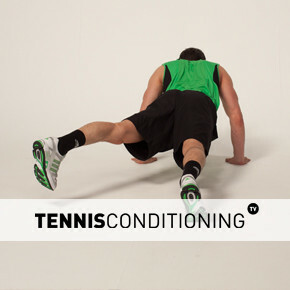 During the Lunge to Med Ball Diagonal Reach the focus is on improving neuromuscular system efficiency because the neuromuscular system works in sync when the athlete moves on the court and hits the ball. If the athlete cannot maintain stability during the Lunge to Med Ball Diagonal Reach then decrease the speed of trunk rotation. If you want to increase the degree of difficulty increase the speed of the trunk rotation.